Gonzaga is one of only 27 schools in the country where both the men’s and women’s teams are playing in the tournament! Gonzaga University will host the first two rounds of the Women’s Tournament at McCarthey Athletic Center March 19 and 21. It’s GU’s first time hosting an NCAA Tourney! Five days later, Washington State University and the Spokane Veterans Memorial Arena will host the Women’s Sweet Sixteen and Elite Eight March 26 and 28. GU Women won the West Coast Conference Championships and will play in Spokane on their home court since GU is hosting the first and second round. Gonzaga Women’s Basketball season ticket holders number nearly 3,000, a school record for the women’s program, and the tournament tickets are nearly sold out! The Gonzaga University Men’s Basketball program burst into the national spotlight in 1999 and has earned consistent national respect with a 12 year consecutive run in the NCAA tournament. Beyond collegiate play, Spokane is home to Hoopfest, the world’s largest 3-on-3 basketball tournament. 6,700 teams, 3,000 volunteers, 40 city blocks and more than 200,000 players and fans. 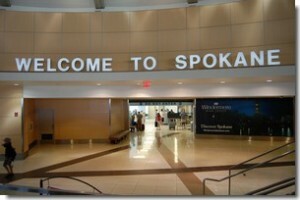 Spokane has really embraced the game… and supports it. It’s really home to some of the best basketball players in the country at their respective levels of play. They realize the NCAA selects the cities carefully when considering where to play the tournament. They are fortunate to have been selected multiple times… and this month they’re making history!